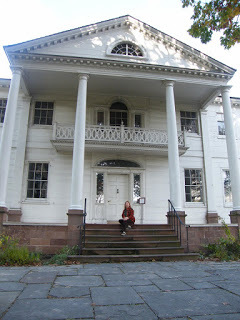 My Visit to Eliza Jumel's Mansion to Research my Book--I Made Eliza's Ghost Laugh! 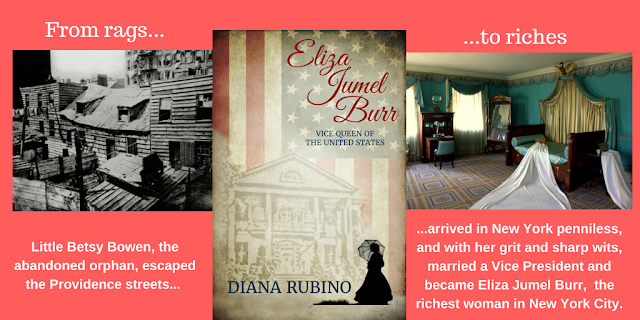 In researching my biographical novel about Aaron Burr and his last wife, Madame Eliza Jumel, I visited her mansion in Washington Heights, NYC. It's beautifully restored and maintained, befitting the once-richest lady in New York. You can also hear the many stories of her ghost wandering the mansion in a purple gown, rapping on walls and windows, and yelling at schoolkids to shut up! 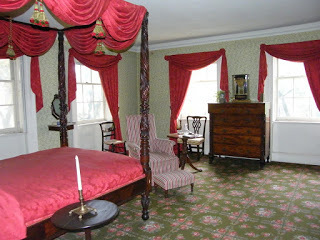 One July night in 1833, Aaron, age 77, showed up at Eliza's door with the same minister who married him to his first wife Theodosia fifty years before. 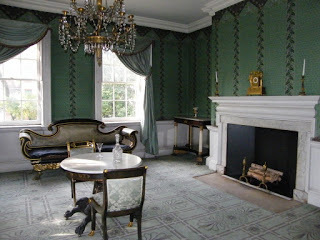 After several rejections of his proposal, she finally agreed to marry him in the front parlor (photo below). When she realized he was a gold-digger (as by then, he was broke), she began divorce proceedings, also charging him with adultery, as he had a mistress in Jersey City. In an ironic twist, she hired Alexander Hamilton Jr. as her lawyer. But in the most ironic twist of all, he died the same day he received the final papers. A minute later, Chris asked me if I laughed after saying that. I definitely had not laughed. That means somebody else did! He'd heard a woman's throaty chuckle, NOT my voice at all. We were the only (living) people up there at the time. I'm convinced it was Eliza, eavesdropping on us, and I was able to give her a laugh. Have you ever heard of a ghost laughing? I never have! If you're ever in the area, visit the mansion--it's an unforgettable experience. My biographical novel is titled ELIZA JUMEL BURR, VICE QUEEN OF THE UNITED STATES. I enjoyed researching this fascinating woman's life.